Native to eastern North America, paw-paw is a large shrub or small tree up to 40 feet tall. A shade-tolerant understory tree, paw-paw prefers moist, well-drained sites such as those near streams ans swamps. The larvae of the Zebra Swallowtail butterfly are known to feed almost exclusively on its leaves. Its fruit, said to derive from the Spanish word for ‘papaya,” ripens in September and can be from 3 to 5 inches in length. 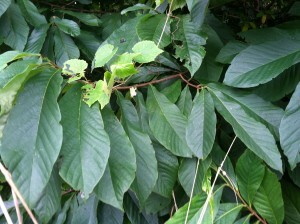 Paw-paw leaves are 6 to 12 inches long and half as wide. Its fruit usually appears in September and turns from light green to dark brown as it ripens. Paw-paw is said to derive from the Spanish “papaya” as its fruit bears a resemblance.